Last week, 5-km asteroid Florence paid Earth a visit—and, using the advanced features of Unistellar's eVscope, we were able to observe it from a location just outside of San Francisco. This, our first attempt to image an asteroid using the eVscope's Autonomous Field Detection (ADF) feature, was a huge success, as you can see in the image, which captures what we saw in the telescope's eyepiece after just three minutes of observing. Asteroid Florence is one of the largest near-earth asteroids (NEAs) yet identified. Shortly after its discovery in 1981 by my colleague Bobby Bus, astronomers realized that this was a very interesting object, roughly 4.4-km across, and with a highly reflective rocky surface. This large asteroid passed by the Earth-Moon system on September 1. At its closest approach it was 4.4 million miles from Earth, so it presented no danger. But ephemeris predicted a visible magnitude of roughly 8, which is quite bright for an NEA. Right after finishing an evening eVscope demo at the California Academy of Sciences, my student Clement Chalumeau and I raced over the Golden Gate Bridge to find a fog-free spot to image Florence. We parked close to Mount Tamalpais and set up our equipment near the road. We knew this left us at the mercy of car headlights; what we did not know was that this also put us in the path of smoke from a nearby a bushfire. And we were dealing with a waxing gibbous moon—clearly, not a great site for enjoying the stars, but we were there. 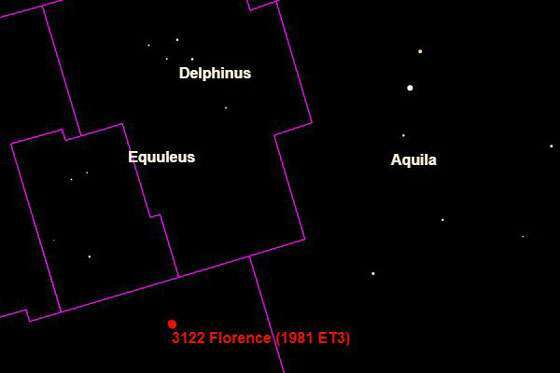 At 10:50 p.m., we pointed the eVscope in the general direction of constellation Delphinus, using a map provided by amateur astronomer Tony Dunn. For the first time, we activated AFD and, using instructions given in the eyepiece that are based on real-time coordinates of the asteroid and recognition of visible stars, we made our way toward the projected position of the asteroid. Five minutes later, at 10:55 p.m., we started collecting data using the eVscope's Enhanced Vision capability. And a few seconds after that, I saw a tiny streak of light in the eyepiece and realized we had pinpointed Florence. Success! 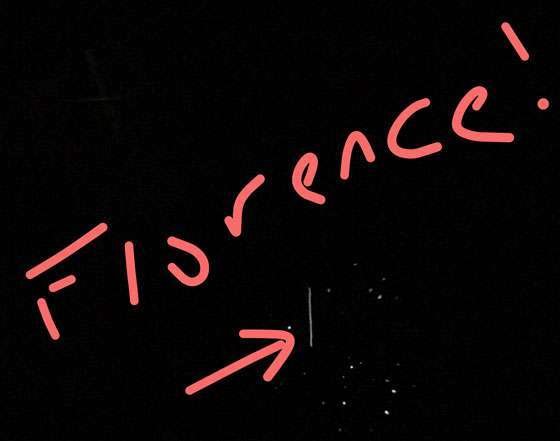 We found Florence easily because it's moving with respect to stars that remain point sources thanks to the tracking of the eVscope and because the asteroid is close to us and moving at a relative speed of ~25 arcmin by hour, after just twenty minutes of observing the dot of light became a line that covered half of the field of view. This left us with no doubt that we had found the fast NEA. This was not the first time the eVscope prototype has observed an asteroid. On April 19, asteroid 2014 JO25 was at its closest approach to Earth (which still left it five times farther than the moon). At 11 p.m., our team in Marseille, France, observed the 650m-diameter asteroid crossing Canes Venatici with a magnitude of 10.7. They did this even though AFD was not yet fully implemented in the prototype. 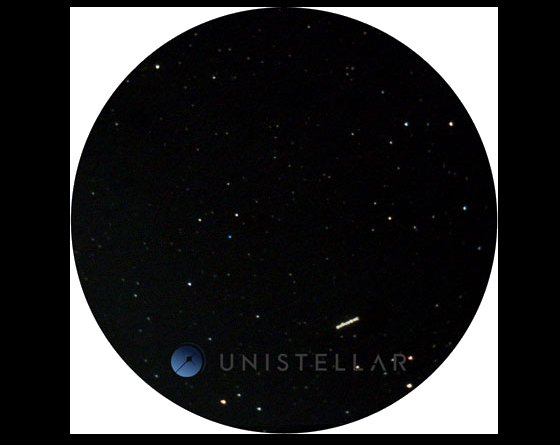 In the future, images of asteroids recorded by owners of Unistellar telescopes will be stored in a SETI Institute database, where they will be available for use by amateur astronomers and scientists. Our goal is to give both experts and laypeople the ability to extract valuable information about asteroids, including their orbit, approximate size, and spin period. This is crucial because early characterization will help us determine if an asteroid might threaten life on Earth—and give us time to prevent a catastrophe by launching a mission to divert it. This is not just a dream: the Unistellar team attended the Planetary Defense conference in Tokyo, Japan in May 2017 to present our project and meet other scientists involved in this research. 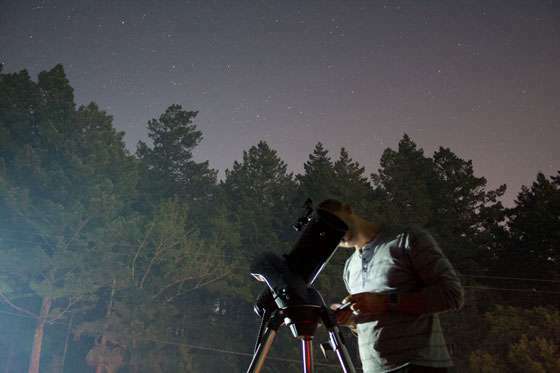 Our dream here is as simple as it is crucial: give eVscope users the ability to observe the night sky as never before—while they contribute to science and to the defense of our planet and every living thing on it.